Love Rick and Morty? Big Justin Roiland fan? You'll want to keep an eye out for Trover Saves the Universe, Squanch Games' first full-length title. We hadn't heard much about it since we got our hands on it during PAX West 2018, but now the team is back with an exciting release date announcement. Trover will be dropping in to bring us some bizarre dialogue, colorful worlds, and some particularly funny exchanges when it comes out this May. Yes, you'll finally be able to get your hands on it, when it's out as a PlayStation 4 and PlayStation VR exclusive on May 31, with preorders open now at physical and digital retailers, including the PlayStation Store. PlayStation Plus members will get an extra 10% off. 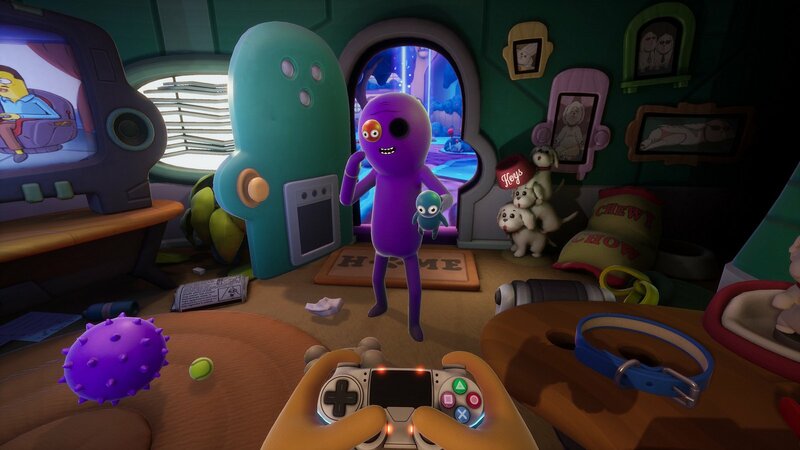 For the uninitiated, Trover Saves the Universe is a "story about you," as Squanch Games co-creator Tanya Watson points out in the official PlayStation Blog announcement. Your dogs have been kidnapped by a beaked "lunatic" named Glorkon. So what does he do? He stuffs them into his eye holes, of course. Your dogs give him the kind of power he needs to destroy the universe, but that's where you come in. You have to stop him before it's too late. You can opt to play via TV or PlayStation VR when the game makes its debut. Also, if you're heading to PAX East, you won't want to miss the Comedy in Games panel, hosted by Justin Roiland, on March 28 at 4:30pm ET. It'll be streamed online as well in case you can't make it out. Roiland will discuss how he's brought his own perspective to comedy in games and will be joined by a panel of other creators. Get ready to join Trover on an adventure of epic and strange proportions when the game drops on May 31.